There are many methods to modify cysteine, which include alkylation, conjugate addition, oxidation, and reduction. Recently, it was found that it is possible to arylate cysteine in the context of bioconjugation using sufficiently activated reagents. The cysteine perfluoroarylation can be used for mild functionalization of cysteine thiolate moieties. This is a new and mild synthetic platform for cysteine arylation. The developed method operates at room temperature in polar organic solvents and shows excellent selectivity and functional group tolerance. As a result, one can utilize this approach towards stapling unprotected peptides, thereby positively altering their biological properties. It was demonstrated incorporation of a perfluoroaryl staple within the small tri-helical affibody protein. 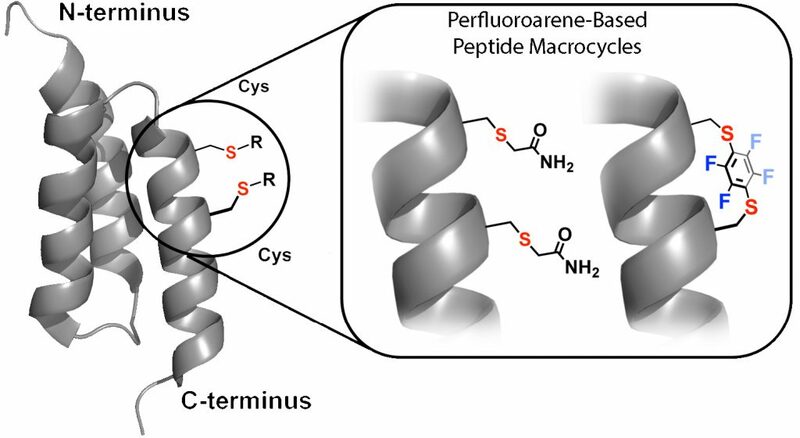 Perfluoroarene-based peptide macrocycle is a stapling modification performed on a peptide sequence showed enhancement in binding, cell permeability, and proteolytic stability properties, as compared to the unstapled analog. It was found that the utility of peptide macrocyclization through perfluoroaryl-cysteine chemistry to improve the ability of peptides to cross the blood−brain barrier. Multiple macrocyclic analogues of the peptide transportan-10 were investigated that displayed increased uptake in two different cell lines and improved proteolytic stability. The abiotic peptide macrocycles can exhibit significantly enhanced penetration of the brain. Cell-penetrating peptides (CPPs) are a promising class of short peptides with the ability to translocate across the cell membrane. In general, CPPs can be divided into three classes: Cationic, amphipathic and hydrophobic. Cationic peptides are a class of peptides that contain a high positive charge such as arginine-based peptides R8. Amphipathic CPPs are chimeric peptides such as SV40 NLS PKKRKV. Hydrophobic CPPs are derived from signal peptide sequences and contain only apolar residues such as transportan and stapled peptides. CPPs have been widely used as a delivery vector due to their high transduction efficiency and capacity for delivering large molecules into a cell. CPPs have the capability to deliver various cargoes without causing any cellular injury. Thus, a wide range of CPP applications are being developed, such as imaging agents and vehicles to deliver therapeutic drugs, small interfering RNA (siRNA), nucleotides, proteins and peptides. Imaging: CPPs can function as vectors to carry fluorescent particles into cells due to their internalization properties and have become promising tools for delivering imaging agents, contrast agents and quantum dots in the field of imaging. The advantage of such imaging technology is the ability to visualize and quantify biomarkers or biochemical and cellular processes, detect the stage of diseases, identify the extent of disease and measure the effect of treatment. Anti-inflammation therapy: Antisense peptide nucleic acids (PNAs) have been shown to specifically inhibit gene expression and growth of E.coli, and are a promising anti‑inflammatroy agent. to target tumor cells, expanding the broad application of CPPs in tumor therapy. Nucleic acid and protein delivery: CPPs can facilitate cellular uptake of large molecules and have been developed as a delivery tool for nucleic acids and proteins. siRNA have been widely used for gene silencing and used to treat diseases such as cancer, infectious diseases and genetic disorders. Viral delivery: CPPs can also be applied to enhance the efficiency of viral transduction. CPP‑modified Adv as a delivery vector is an attractive tool for transducing cells and gene therapy. 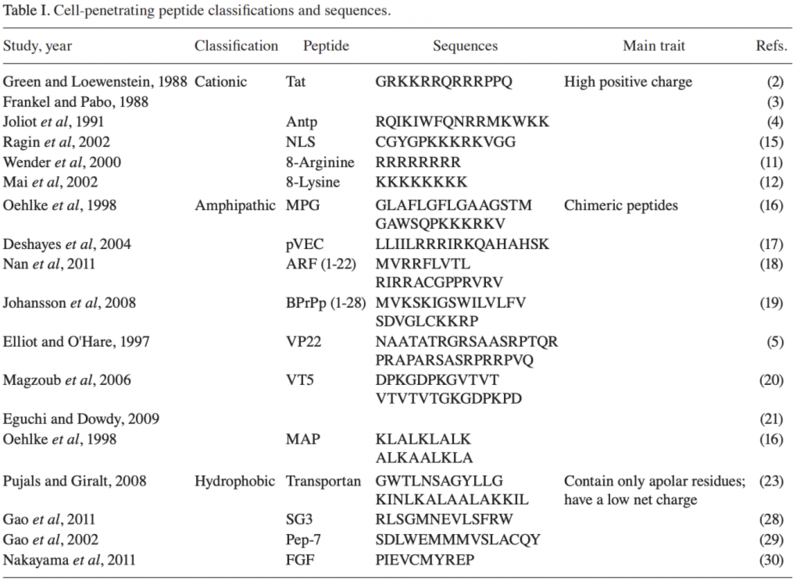 Antimicrobial peptides (AMPs) represent promising alternatives to conventional antibiotics. These antimicrobial peptides form pores by interaction with the peptide and lipid from bacterial membranes. Thus, AMPs will interfere with cellular processes and metabolic pathways. Peptidomimetics are to mimic natural peptides three-dimensionally in order to preserve their biological activity and obtain high stability, resistance to proteolysis, and bioavailability. Slight modifications in the amino acid composition can change the geometrical disposition and physicochemical properties of a peptide. The most common features relevant for AMP design are net charge, hydrophobicity, and helix penalty of each residue separately. Natural AMPs vary from +3 to +6 net charge because the bacterial membranes have large quantities of negatively charged molecules. The bacterial membrane is composed mostly of lipids. Therefore, hydrophobicity is an important feature for designing peptides with antimicrobial activity. The percentage of hydrophobic residues in naturally occurring peptides are between 40% and 60%. Modifying amino acids can enhance the stability of peptides by increasing their resistance to proteolytic degradation. An example of this approach is to replace tryptophan or histidine residues with the bulky amino acid beta-naphthylalanine. 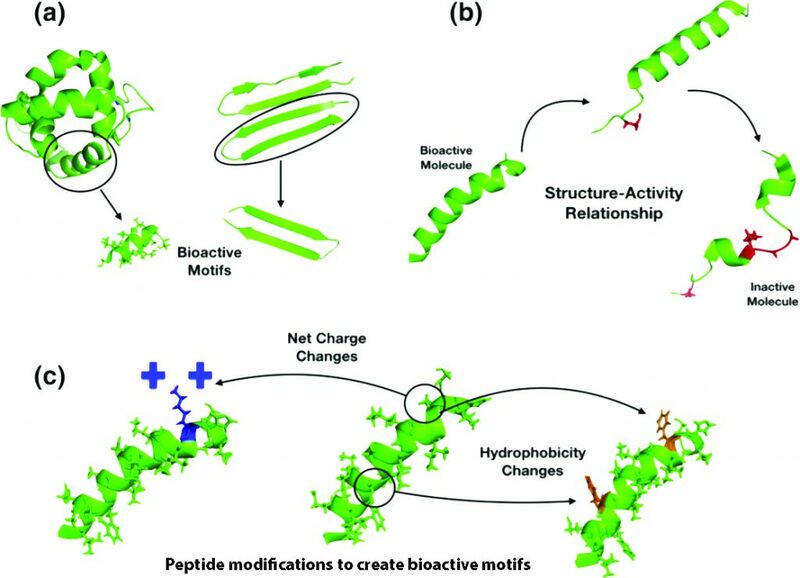 Peptides are promising compounds not only for antimicrobial therapeutics but as immunomodulatory agents and anticancer drugs. Glycosylation of peptides is a promising strategy for modulating the physicochemical properties of peptide drugs and for improving their absorption through biological membranes. The glycosylated peptide can target specific organs, enhance the biodistribution in tissues, improve penetration through biological membranes, increase metabolic stability and lower the clearance rate, receptor-binding, protect amino acid’s side chain from oxidation, and maintain and stabilize the physical properties of peptides, such as precipitation, aggregation and thermal and kinetic denaturation. 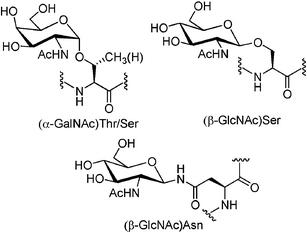 The modification of peptide with different sugar entities, such as mannose, galactose, and N-acetylgalactosamine (GalNAc), exerts diverse impacts on the conformational properties of the polypeptide chain. The position of the glycosyl unit in the peptide’s structure is an essential factor in changing the conformation of the peptide backbone and may affect the biological properties of the modified peptide. 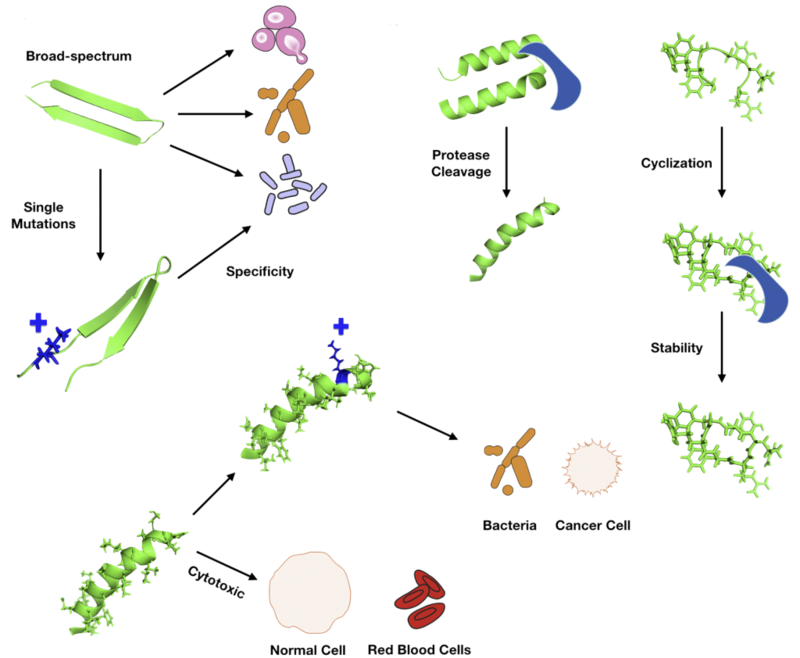 LifeTein is willing to work with you for the development of therapeutic peptides using different glycosylation strategy. For example, the improved permeability and higher metabolic stability of the glycosylated neuropeptides resulted in a significant increase in their bioavailability, which might account for the enhanced analgesic effect of the glycopeptides. LifeTein’s technology will help your development of carbohydrate-modified peptide drugs. Various modifications have been incorporated in the peptides such as acetylation, amidation, cyclization, PEGylation, glycosylation, succinylation, and hydroxylation, to increase the half-life of peptides. Bioactive head-to-tail cyclic peptides are promising lead structures for the development of new pharmaceuticals with their high selectivity, potency, and improved enzymatic stability. Cyclic peptides are usually synthesized with an N-terminal amide linkage that closes the ring structure with a C-terminal carboxylic acid. The current methods for amide formation are expensive and inelegant as the top challenge for organic chemistry. The issues of waste and expense associated with amide formation are responsible for the enormous cost of commercial therapeutic peptides. The reaction typically renders a very low yield. Recently, LifeTein developed a single-step preparation of the amide cyclization with a high yield. The resulting peptide macrocycles are conformationally stable with multiple intramolecular hydrogen bonds. LifeTein’s advances in amide-forming methodologies can have far-reaching impacts across scientific disciplines. The unnatural amino acids can be easily incorporated during the synthesis for stability or enhanced activity, or specific probes for interrogating binding and biological function during the synthesis. The improved amide-forming chemical reactions will not damage the structure of any unnatural amino acids. This cyclization method allows us to synthesize complex, highly functionalized amide-based structures without the need for aggressive reactants, expensive protecting groups and longer reaction times. Peptides are suitable for targeting protein-protein interactions and using as smart delivery systems for targeting to cancer cells. The main drawbacks of peptides are their susceptibility to enzymatic degradation and rapid kidney clearance. So, it is crucial to stabilizing the peptides with unnatural modifications such as modifications of the peptide backbone, lipidation, attaching polymers or modulating the primary, secondary, tertiary or quaternary structure. The peptide backbone can be modified for facilitating the peptide synthesis, increasing their solubility, and improving the pharmacological and pharmacokinetic properties. Many building blocks such as pseudoproline dipeptides are efficient tools for disrupting secondary structures. In peptide chemistry, some common practices are used for decreasing fragility of peptides such as D-amino acids, azapeptides, methylation, backbone cyclization or secondary structure constraints. This unnatural modification has a significant impact on the extended response and stability to peptides. Lipidation using Cholesterol, fatty acid, or palmitic acid is a modification used for transforming peptides to peptide therapeutics. Lipids conjugated to peptides will increase their half-life by stabilizing their structure or binding to the cell membrane. The most prominent lipidated peptide drugs are insulin derivatives and glucagon-like peptide-1 (GLP-1) receptor agonists: liraglutide (Victoza). The combination of PEGylation and cholesterylation has been used for developing anticancer delivery systems to increase the antiviral potency of peptides and to boost their half-life in vivo. The introduction of differently sized polymers such as the amphiphilic polyethylene glycol (PEG) is a highly popular tool in peptide chemistry. Each oxygen atom in a PEG polymer can bind two to three molecules of water, thus significantly increase the size and solubility of the peptide attached to it. The PEGylated peptides have increased peptide solubility, lower immune response, and increased peptide bioavailability. There are fifteen PEGylated peptide drugs approved by the FDA. How long do peptide last in the fridge? How should peptides be stored? For long-term storage the peptide should be kept in solid form in the deep freezer at < -15 °C. If stored at room temperature some peptides containing methionine or cysteine may begin to degrade. Therefore, we recommend storing them at -20C as soon as possible after receiving the package. At -20 or -80, the peptides will remain potent for 6 months or years before beginning to degrade. For short-time storage a refrigerator (+4 °C) will suffice. Peptides should be protected from intense sunlight. Peptides containing fluorophores should be kept in the dark. What may happen during the peptide storage? Some typical degradation reactions or racemization may include the oxidation of Met, Trp, Tyr, or Cys. The deamidation of Asn, Gln, and the C-terminal amide may happen. The aspartimide may form. There might be the cleavage of Asn-Pro. The N-terminal Gln may form pyroglutamine. The dimerization of Trp and Tyr may form. Are peptides soluble in water? This is a list of non-polar, hydrophobic, or water-fearing amino acids: Ala (A), Ile (I), Leu (L), Met (M), Phe (F), Pro (P), Trp (W), Val (V). Peptides containing 50% and more hydrophobic or nonpolar residues as above might be insoluble or only partly soluble in aqueous solutions. In this case, dissolve the hydrophobic peptides in the small volume of 50% (v/v) DMSO, DMF or acetonitrile in water first. Then add water or buffer to the desired concentration. What is the best way to keep synthetic peptide in solution? Dissolved peptides are less stable than the lyophilized dry powder. The solutions should be aliquoted before freezing to avoid thawing-refreezing cycles. Peptides containing Asn, Gln, Cys, Met, Trp, Tyr may be less stable because of the possible oxidization. The stock solutions should be in dry organic solvents to avoid premature hydrolysis. The buffer of pH 5-7 is considered as optimum for the stability of the aliquots. The peptide (>95% HPLC purity) solutions with cell cultures are frequently used without any sterilization. If the experiments are typically as short as a few hours, the bacterial contamination wouldn’t be a problem. Why do the dissolved peptides lose their activities? How to prevent peptides from losing their bioactivities? The oxidation of Methionine yielding the sulfoxide might be the main reason for losing the peptide activity. The rate of sulfoxide formation is sequence-dependent. The best way is to replace the Methionine with its stable isostere Nle. Sulfotyrosine-containing peptides may lose their activity due to the desulfation. Are peptides containing free Cys supplied as monomers? Will the Cys-containing Peptides be easily oxidized? LifeTein provides Cys containing peptides as monomers unless specified otherwise. As air oxidation cannot be completely prevented, reducing the peptide before use by treatment with dithiothreitol (DTT) may be helpful to your experiment. How to dissolve amyloid beta protein (1-40)? The freshly made Aβ (25-35) and (1-40) are soluble in oxygen-free water. Some old peptides may require the addition of acetic acid for dissolution. Do not dissolve the amyloid peptides in PBS. It is better to try water or 50% acetic acid and then dilute with the working buffer. Dry ice is not required for the shipment of peptides. The lyophilizates in vacuum sealed vials are sufficiently stable to tolerate 3-5 days at ambient temperature. Upon receipt, the product should be stored at the recommended storage temperature of -20 or -80. Can I convert a free peptide or peptide with free acid into the peptide amide? Unfortunately, the C-terminal carboxylic group cannot be converted to a carboxamide once the peptide is synthesized. The peptide amide has to be synthesized and cleaved in a different method. Do I expect batch-to-batch variability? The impurity profile and especially the peptide content can vary from batch to batch, even if we use the same the standard protocols of synthesis and purification. What is the difference between research-grade and GMP-API? The Research-grade peptides are for laboratory and research purposes only! They may not be used as drugs for humans. The GMP-APIs are peptide products applicable to humans. Most peptides contain the basic functionalities: the guanidino group of Arg, the ε-amino group of Lys, the free N-terminus, and the imidazole moiety of His. These basic functionalities can form salts with acids. All our peptides are provided as trifluoroacetate salts unless specified otherwise. During cleavage from the carrier resin and purification, the peptide will react to the trifluoroacetic acid (a strong acid). The additional ion-exchange steps are needed to make the acetate salt or HCL salt form peptides. Some acidic peptides, containing Asp, Glu, phosphor group or sulfotyrosine, can form salts with bases and may be provided as the ammonium salts. How do you purify the peptides? How pure are your peptides? Peptides obtained by SPPS are usually purified by the preparative RP-HPLC. The HPLC-purity of most of our peptides is 95% or above. The lower purities may be expected for peptides containing free Cys, an N-terminal Gln, or sulfated peptides. The purity could be improved with the optimized synthetic and purification methods. How do you synthesize small peptides? Dipeptides, tripeptides and other short peptides are usually synthesized in the solution called Liquid Phase Synthesis. Fmoc- SPPS (solid-phase peptide synthesis) is the main method. The peptide is elongated starting from the C-terminus to the N-terminus of the sequence. An inert, insoluble but swellable polymer resin is used and the amino acids are added in the C→ N direction. 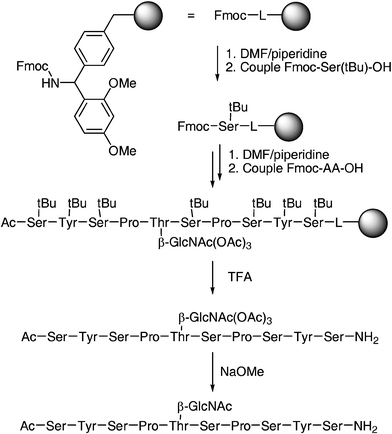 After each coupling step, the Nα-blocking group is removed through repetitive protection and deprotection steps. LifeTein’s peptide synthesis method is fully automated. Pyroglutamyl is abbreviated as Pyr. The natural peptides consist of L-amino acids. The D-enantiomer and the racemate are designated by -D- and -DL-, respectively. All α-amino acids are asymmetric molecules except glycine. They can be obtained in two forms called enantiomers. Enantiomers differ considerably in their biological activity. The D-enantiomer (D: dexter) represents the mirror image of the L-enantiomer (L: laevus). D- and L-enantiomer do not differ in their physical properties. Most L-amino acids rotate the light counterclockwise. How to dissolve the peptide? The solubility of a peptide is primarily dependent on the physical properties of its amino acids. Basic peptides: The number of basic amino acids including the N-terminal amino group is more than the number of acidic amino acids including the C-terminal carboxyl moiety. The basic peptides may be dissolved in a small amount of an acidic solvent such as acetic acid or trifluoroacetic acid (TFA) and then diluted to the desired concentration. Acidic peptides: The number of acidic amino acids including the C-terminal carboxyl group is more than the number of basic amino acids including the N-terminal amino group. The acidic peptide may be reconstituted in a small amount of a basic solvent such as 0.1% aqueous NH3 and then diluted with water to the desired concentration. The peptides containing free cysteines should be dissolved in the degassed acidic buffers because the thiol moieties could be rapidly oxidized at pH > 7 to disulfide bonds. Neutral or highly hydrophobic peptides containing a high proportion of polar uncharged amino acids and/or hydrophobic amino acids should be dissolved in a small amount of an organic solvent such as DMSO, DMF, acetic acid, acetonitrile, methanol, propanol, or isopropanol and then diluted with water (or buffer) to the desired concentration. Denaturating agents, such as urea or guanidinium hydrochloride may be used to solubilize peptides which tend to aggregate. The reconstitution of the aggregated peptide may take up to several hours. Sonication for several minutes in a water bath may be helpful to accelerate the dissolution of larger particles. The peptides containing Trp, Met or Cys residues require special care to avoid oxidation. What are the four levels of protein folding? There are four stages of peptide or protein folding, primary, secondary, tertiary and quaternary. The secondary structure is the protein beginning to fold up. It can have two types of structure: the alpha helix, a coil shape held by hydrogen bonds in the same direction as the coil. Why does peptide unfold at high temperatures? Heat can be used to disrupt hydrogen bonds and non-polar hydrophobic interactions. This occurs because heat increases the kinetic energy and causes the molecules to vibrate so rapidly and violently that the bonds are disrupted. What factors can disrupt the peptide structure and thus denature the peptide or protein? Changing in pH and salt concentration will alter electrostatic interactions between charged amino acids. Higher temperatures reduce the strength of hydrogen bonds. The presence of the reducing agents will break disulfide bonds between cysteines. However, none of these agents breaks peptide bonds, so the primary structure of a protein remains intact when it is denatured. All forms of antibodies, polyclonal, hybridoma-based monoclonal and recombinant monoclonal have both pros and cons as research tools. The polyclonal antibodies display multi-epitope binding properties. However, the polyclonal antibodies could present variations in antibody performance. The monoclonal exhibit precise and reproducible binding properties from batch to batch. The recombinant monoclonal offer the specificity and reproducibility and do not suffer from clonal drift or gene deletion. However, the monoclonal antibodies are costly to produce. The polyclonal antibody is invaluable research tools if the antibodies are developed, validated with the correct specifications. The polyclonal antibodies allow the binding of multiple antigenic determinants of the target. This enables polyclonal antibodies to be more sensitive with greater stability. The various binding of several different epitopes will make it more successfully bind a specific antigen in different immunoassays. For example, it is more effective at detecting a target for use in chromatin immunoprecipitation. The polyclonal antibody is a better option for many test conditions because their multi-epitope binding allows for antigen recognition even if some of the epitopes are affected by changes in an antigen’s tertiary structure or accessibility. However, the monoclonal antibody may have their epitope buried. It is more visible to use the polyclonal antibody for the western blotting experiment due to multi-epitope binding. The polyclonal antibody is a mixture of antibodies with different biophysical attributes, such as charge and hydrophobicity. They are more resistant to changes in temperature and pH when compared with monoclonal antibodies. Usually, it is required to have the stabilizing agents to prevent aggregation, precipitation and preserve antibody binding for the storage of monoclonal antibodies. A wide range of host animals. The polyclonal antibody can be generated in a wide range of host animals including rabbits, rats, mice, chicken, duck, goats, sheep, donkey, or even horses. The applications are flexible such as the quantity of the antigen, the injection methods and sites, the choice of adjuvants, and the duration of immunization schedules. The large animals with greater total blood volume will produce large amounts of antibody over time because of the increased yield of serum and the longevity of the animals. Limited supply. This can be solved if the protocol is closely followed to guarantee the reproducibility. Cross-reactivity. This can be eliminated by negative absorption during affinity purification on a column containing the immunogens. The peptide antibody is especially valuable because of the specific immunogens with known sequences. The phosphor-peptide antibody production will go through the double screening process. First, the antisera would go through the non-phosphor-peptide column to remove the unwanted impurities. The elution will then go through the phosphor-peptide column for specific binding. Lot-to-lot consistency can be effectively managed and controlled by comparing the existing lots to historical lots.